But, can your child name this eagle? The website, Military Youth Saves, sure hopes that he or she can. Military Youth Saves is a social marketing program designed to encourage kids and teens to develop good savings habits at a young age. The website and effort are brought to us by the great website, Military Saves, and they want your children to be a responsible saver and to spread the savings message to their family and friends as well. 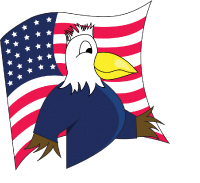 Help name the website’s Military Youth Eagle mascot and win a $50 Savings Bond and a Military Saves Coin. Send your submissions to [email protected] by 30 June 2009. I guess your child would suggest “Eagie” for the eagle? =) I kind of like “Pinch” for the crab, that’s a cool name. I’m glad to see that they are trying to get kids involved in a savings mindset, and hope that the savings bond will be some insurance that many families will participate. I will visit this site with my daughter when she gets home this afternoon!